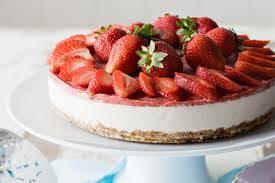 I love this Frozen Strawberry Cheesecake! I have had the recipe for 21 years and it is a favorite. I must also confess that I am a fan of cold-set cheesecakes rather than the baked varieties. This cheesecake is different though, it’s set in the freezer. This is ideal as it can be made the day before its needed but then again, you can do that with any cold set Cheesecake. If you love cheesecakes you have to try this one! Beat egg yolks in a small bowl with an electric mixer until pale and thick.